HOME / Our blog / Wondering what the best white noise machine for back to school is? Start fresh this September with sleep and study sound therapy systems by Sound Oasis®. With 3 Bluetooth options to choose from, each including our premium Sound Oasis Apps (a $13 value) free, alarm clock combinations to help you wake refreshed and on time, and leading-edge sound technology for travel, you’ll find the white noise machine that fits your life at SoundOasis.com. The newest addition to our sound machine family, the compact and lightweight, BST-80 is ideal for home, travel and life on campus. Equipped with optional headphone output and Bluetooth streaming capability, our latest sound therapy system may be used to create a better atmosphere for sleep or study wherever the semester may take you. 20 of our most popular relaxation sounds, including calming, doctor-developed pink noise, are included with your BST-80 on micro SD. Visit our online store for more exclusive downloads, including 8-hour tracks for uninterrupted sleep, or to request your custom sound card. At just $39.99, the BST-80 is the perfect gift for the student of any age. 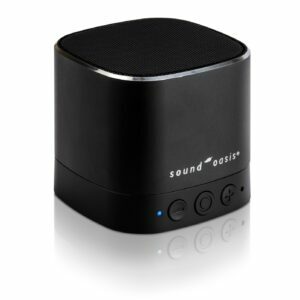 Our original and most highly requested Bluetooth sound machine. Developed in partnership with doctors and sound therapists, the BST-100 delivers high quality sound for sleep and relaxation. Versatility also makes this model a great value. Featuring Bluetooth technology, headphone output and optional auxiliary input, the BST-100 is ready to stream your favorite playlists direct from your phone or mobile device for crystal clear sound. Discover next level sound with BST-400 high fidelity stereo. Built to last with a dual speaker and subwoofer system, this performance sound machine is compatible with our white noise App and your Bluetooth enabled device such as laptop, tablet or phone. A micro SD preloaded with 10 unique tracks for relaxation and sleep is included, as well as a wall plug/charger and micro USB cable for quality sound you can count on. 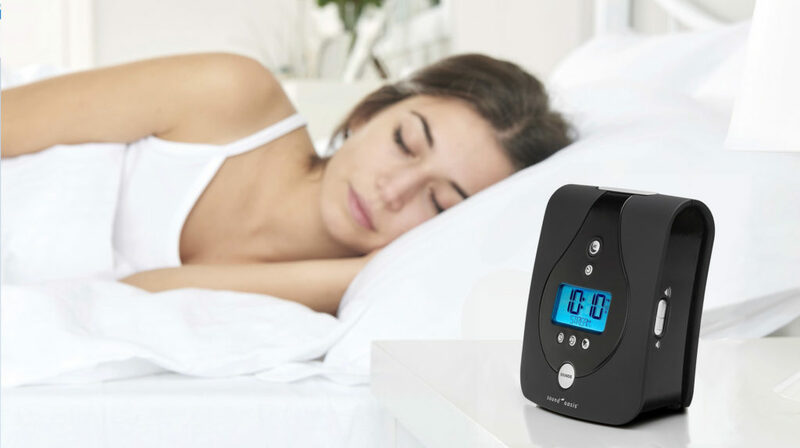 Rest easy with the Sound Oasis Advanced Sleep Sound Therapy System alarm clock. The next generation in white noise technology, model S-680-01 is one of our most popular sound machines re-imagined with superior quality audio, our patented Sleep Enhance™ experience, custom playlist and a sleek, user-friendly design. Just right for your bedside at home or in residence. 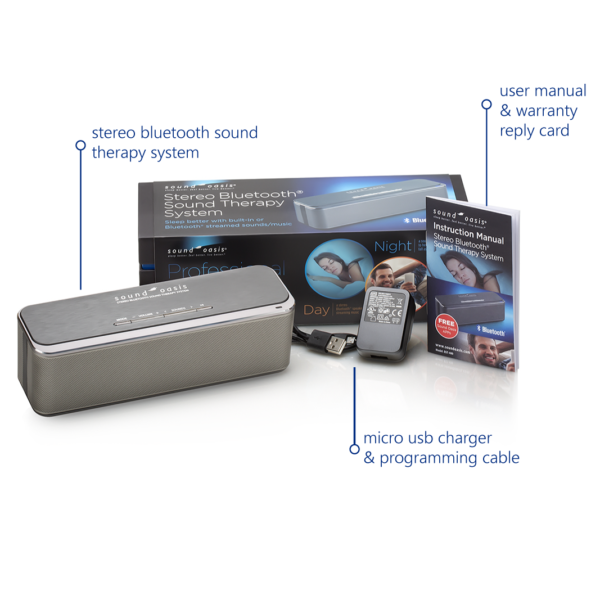 Exceptional sound therapy technology you can hold in the palm of your hand. 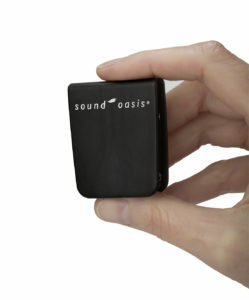 Introducing The World’s Smallest White Noise Machine, by Sound Oasis. Portable, affordable, and featuring a built-in rechargeable battery for extended play, this tiny powerhouse includes 10 separate tones of clinically proven white noise for sleep and concentration. Made for life on-the-go, The World’s Smallest White Noise Machine includes premium ear bud headphones, a USB cable, carrying case and clip-on feature for added convenience, and volume control for your comfort. Presenting high quality audio for enhanced focus, rest and relaxation, the Sound Oasis digital library delivers the soundtrack for your best school year yet. 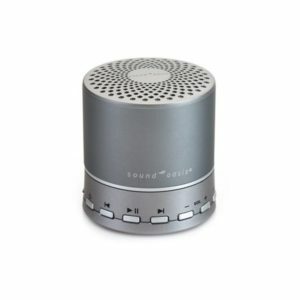 Our top-rated white noise machines include doctor-developed sounds and professional nature recordings on micro SD designed to help you block the unwanted distractions and noise keeping you from more effective sleep and study. Explore the complete collection at SoundOasis.com. To create a custom SD card, choose the number of sounds and then individually select each sound that you prefer.